The trouble with Bruce Wayne, aside from everything awful about his lfie, is that when he’s not tangling with Gotham City’s criminally insane, he’s associating with its twatty aristocracy. And it turns out that same shorthands that comic book writers use to convey affluence are often the same ones used by soap opera writers. Thus, Bruce’s crew sound like a bunch of soap opera heavies. 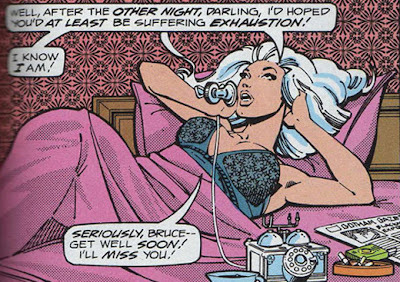 Truly, Bruce Wayne can’t ever get a break. In Gotham City: Bruce’s bodyguard, who naturally gets framed for the murder of Bruce’s girlfriend at the time. Later, she becomes a cyborg. Of course. But She Sounds Like: The long-lost Russian-French twin to Irish-Bavarian society queen, Siobhan Hefeweizen. In Gotham City: She’s the very love interest whose murder sends Sasha and Bruce to jail. Pre-corpsehood, she’s a Lisa Loeb-looking media muffin. But She Sounds Like: A blatant attempt to mash the allure of James Bond’s most treacherous love into the ageless beauty of Morgan Fairchild. 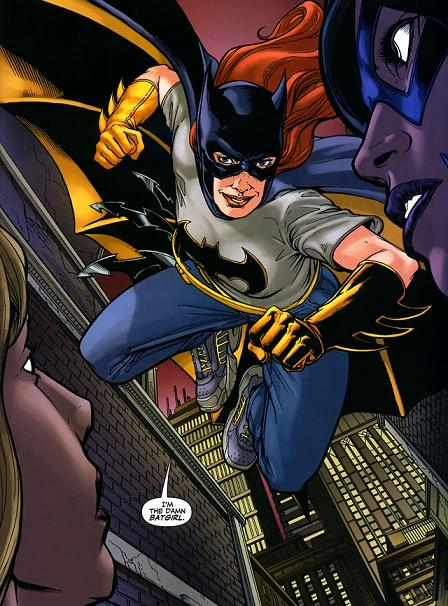 In Gotham City: She’s Misfit, who initially steps onto the Gotham City super hero scene by dressing up at Batgirl. But She Sounds Like: A headmistress at a girl’s boarding school whose raging lesbianism is an open secret. But She Sounds Like: As I’ve noted before, the result of a writer who doesn’t know the term “on the nose” and who thought it would be cute if this character represented Bruce’s struggle to integrate the two extremes of his personality into a happy medium. 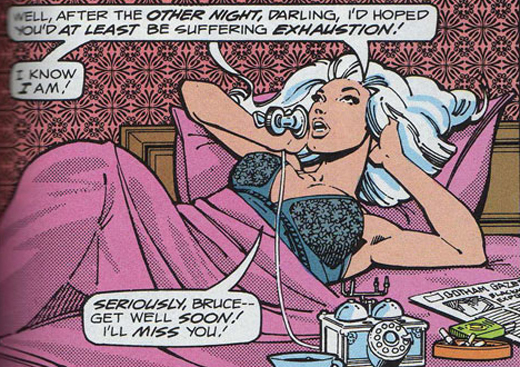 In Gotham City: A white-haired love interest for Bruce Wayne who debuted in 1977 and literally could not look more like a character who debuted in 1977. 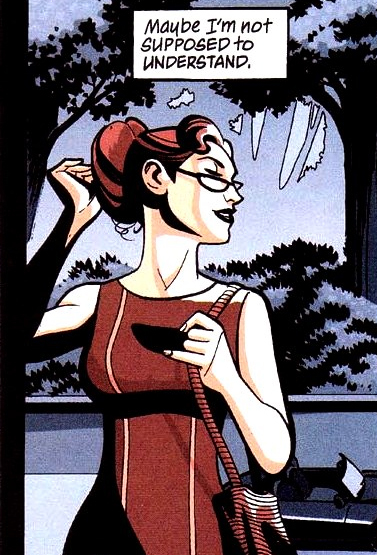 She returned to the series and in 2009 met the kind of bad end that most women in Bruce’s life meet. But She Sounds Like: An inexplicably long-lived heroine played by the washed-up actress character, Alabaster Verdegris, on the soap opera-within-the-soap opera. 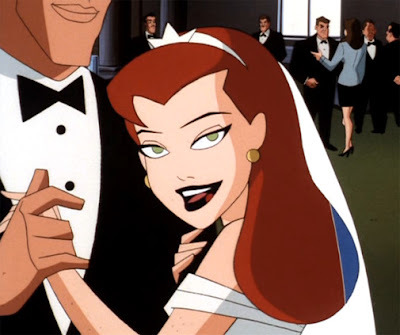 In Gotham City: She’s Bruce’s Lana Lang, more or less, in the animated Batman show, and the events she attends draw more supervillains than a Cabot Cove dinner get-together draws murderers. But She Sounds Like: She has an especially good “superhero” double initial name — Vr. 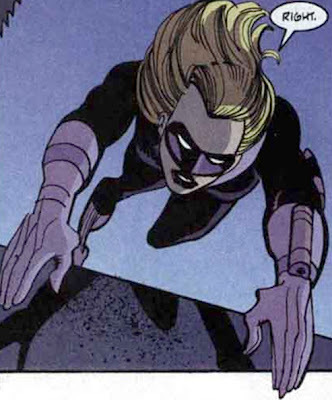 Vr., basically “Vroom Vroom” — but she sounds more like the popular girl who makes life hell for the new girl in town. 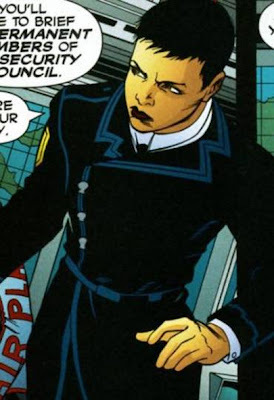 In Gotham City: She’s Sasha Bordeaux’s colleague in the spy agency Checkmate. She seem all that happy about that. She, um, has short hair. But She Sounds Like: The walking photo negative of the more wholesome Sandra Sue Albright. Naturally, Sandra Sue eventually finds out this bad girl is her own an alternate personality, brought about in the most dramatic possible way, and she greets the news with her trademark sunny disposition. 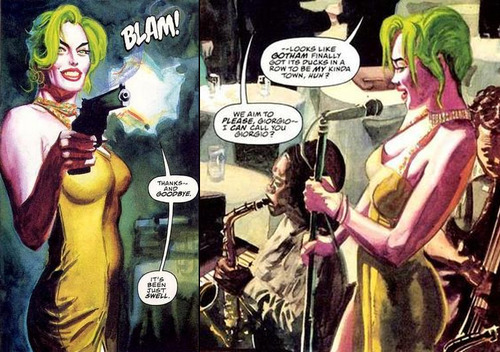 In Gotham City: She’s an alternate version of the Joker whose Joan Crawford looks combine with a maniacal clown aesthetic to create a truly disturbing effect. But She Sounds Like: Actually, that’s pretty much exactly what she sounds like.